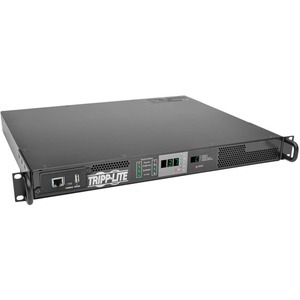 The PDUMNH16HVAT 3.7kW Single-Phase 230V ATS/Monitored PDU provides remote power monitoring and enables redundant power for network devices with non-redundant power supply configurations. 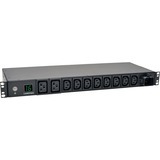 Ideal for data centers and server rooms, it mounts in 1U of space in EIA-standard 19-inch racks and has an IEC309 16A Blue outlet for connecting a single device or a 0U 230V vertical PDU with IEC309 16A Blue plug. 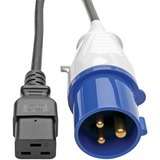 Dual 10-foot input cords with IEC309 16A Blue plugs connect to separate primary and secondary single-phase power sources, including out-of-phase sources. The PDU constantly evaluates the power quality of both input sources. 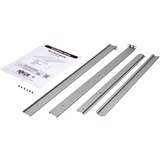 Dynamic solid-state (TRIAC) automatic transfer switching allows the PDU to switch to the secondary source within 1-5 milliseconds if the primary source fails or becomes unstable to ensure connected equipment remains powered. Built-in LX Platform network management interface card. The Java-free LX Platform HTML5-based network interface enables full remote access for PDU status monitoring and email notifications via secure web browser, SNMP, telnet or SSH. 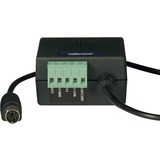 It supports 10/100 Mbps auto-sensing for optimum communication with an Ethernet network. Optional EnviroSense2 modules (sold separately) provide a variety of environmental monitoring capabilities. Protocols supported include HTTP, HTTPS, SMTP, SNMPv1, SNMPv2, SNMPv3, telnet, SSH, FTP, DHCP and NTP. Digital display with LEDs indicates power availability, voltage, input status for both power sources, output load and power factor, as well as temperature and humidity conditions with optional ENVIROSENSE2 module (sold separately).